Your My Workspace is a personal workspace that offers a handful of configurable widgets such as "My Recent Projects", "My Recent Repositories", "Git Code Reviews", "Project News" and so. 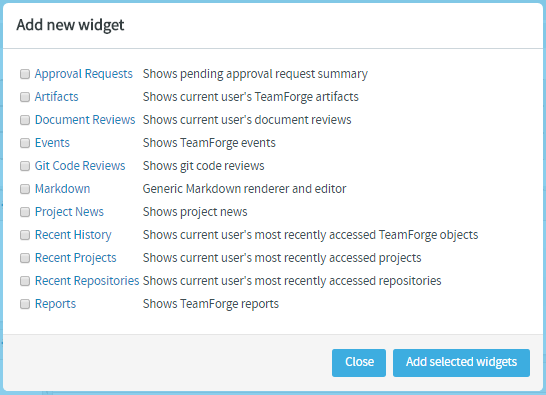 You can use these widgets to view recent projects, recent repositories, recent commits, items assigned to you (TeamForge artifacts and document reviews), Git code reviews, project news and reports. Select a dashboard from the drop-down list and click the customize ( ) button. Select a suitable layout that should accomodate your widgets appropriately. Click Add widget and select a widget. For details about each widget, see . Click Add selected widgets to get the selected widgets added to your dashboard. Click Close to get back to your dashboard without adding widgets. Note: You can add multiple instances of the same widget to your My Workspace. For example, you can add two instances of the Artifacts widget, one each to show the "Open" and "Closed" artifacts assigned to you. Repeat steps 5 through 8 to add and configure more widgets. When you are satisfied with your changes, click Save . There is a Cancel button if you do not want to keep your changes and the Use default button will return the dashboard to the default settings. Create as many dashboards as required. You can select a dashboard from the drop-down list and click the button to delete the dashboard. Artifacts: Shows artifacts from one or more projects. You can filter artifacts based on a number of filters such as Assigned To, Priorities and so on.